Part 2 of 2 on The Beauty of Weight Gain During Pregnancy: Psychological Effects on Women. The following was written during my 3rd trimester, May of 2015. The challenge for me is the physical toll it is taking on my body. as I became fatigued, depressed, and heavy feeling. Seriously?? This cannot go on for the next 3 months! So I took action and had to change-up a few things in my life allowing me to gain endurance to make it through the not so pleasant 3rd trimester. …replacing ice-cream at night with plain yoghurt and frozen berries (which is cold and creamy like ice-cream, yet much healthier for you, obviously.) The result is that I slept soundly and was able to wake up refreshed, rather than tired and dragging. A little common sense here: if you put heavy, sugary stuff in your body before you go to bed, you’re not going to feel great the next day. …working on hugging the baby and engaging my back. 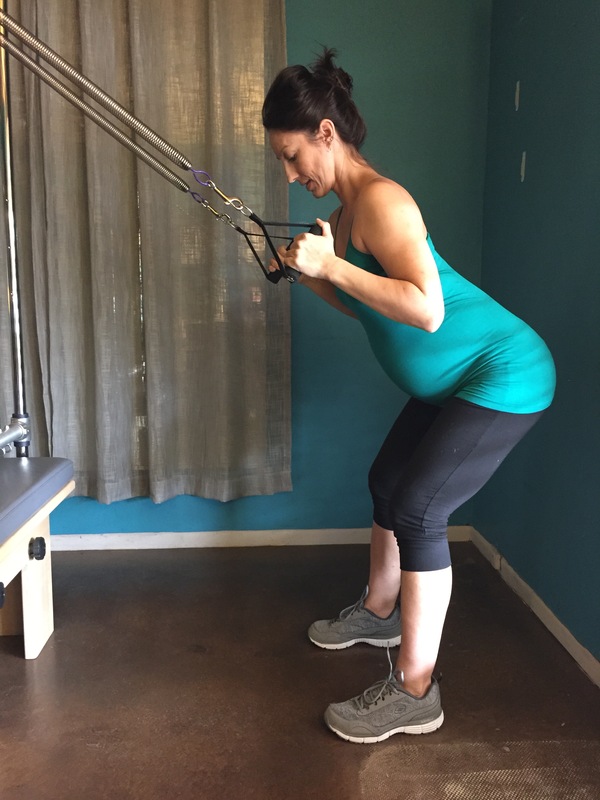 The next day after my first session, I felt lighter and tighter, and grateful that I had found something that was going to save me from a miserable countdown to the birth of our son. I know I am blessed to be having an easy time adjusting to all of these changes necessary to grow a human. So I want to recognize women who may not be having a great time adjusting to the weight gain, both physically and psychologically. Negative attitudes about gaining even recommended amounts of weight during pregnancy are common even among relatively affluent and well-educated women. I asked a group of my mommy friends to share their feelings about gaining weight during their pregnancies. Even the women who started out at a healthy weight and continued to term looking fabulous, expressed insecurities about how they looked towards the end. 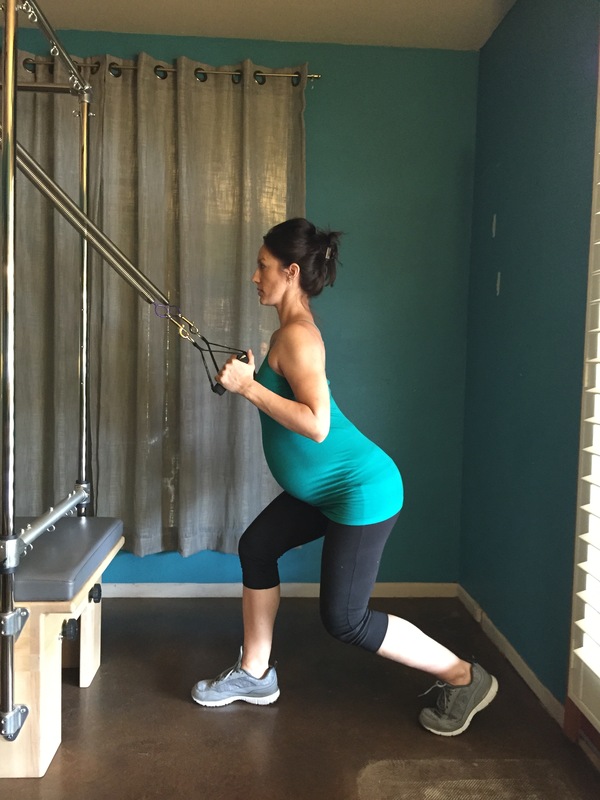 I think with my first pregnancy, I was terrified of gaining weight. I think it was just the normal fear of gaining weight, period, and then having to lose it. I was very sick at the beginning and lost a lot of weight and people just kept saying, you look so good!! I think there is so much media surrounding celebrity pregnancies and bash them for getting “fat” when pregnant so I thought, Oh!! I need to keep this weight off now. I had gestational diabetes which restricted my diet. But I was still so scared to gain the weight that I would deny myself certain things, which resulted in the baby taking nutrients from my body. I never felt good and it took a toll on my body. With my third baby, I took better care of myself. I didn’t have gestational diabetes, I felt better, I gained 20lbs and I was fine with it…and the 20lbs fell right off after. Looking back, I wish I had just enjoyed my first 2 pregnancies a little more and stressed a little less about the weight. Elizabeth’s experience with becoming thin unintentionally (because of illness), and then being praised for looking “so good,” is not uncommon in this superficial, celebrity-centered society that we live in. It breaks my heart to hear these stories, and to know the mental and emotional struggle women go through with their weight, all because the media and society has set these unrealistic expectations. So what can we do about it as fitness professionals? Avoid superficial compliments concerning weight. can have a negative effect on a pregnant client who struggles with weight issues, similar to Elizabeth’s experience. Instead, focus on compliments that include the health of the baby she is carrying and the benefits to her health and comfort. ” I noticed how you walked in here today standing taller! 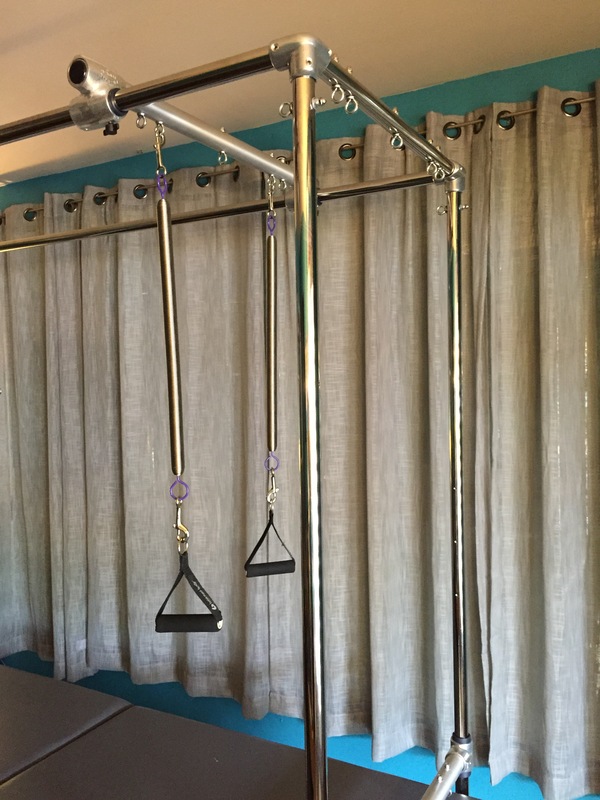 This is so important for giving that baby room to grow and helping to alleviate discomforts for you“. Taking the focus off of how mom looks and turning the focus to her amazing body and what it is doing to grow a human inside of her, may help her start to change destructive thought patterns that she may have struggled with most of her life! The following exercises help with lower body strength and stability, while working the Lats and Back. 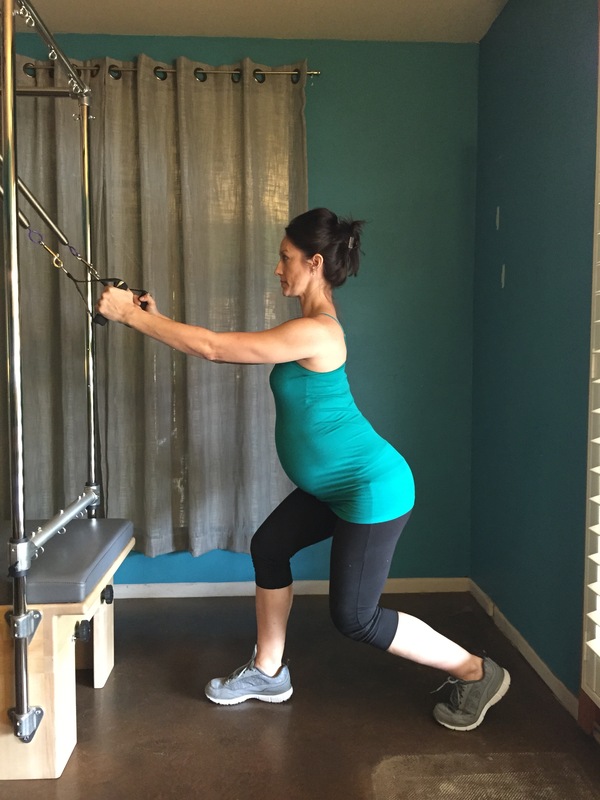 They are Diastasis Recti safe. Squat/Lat Pulls – Step 1: Knees in line with ankles with weight primarily in the heels. Glutes should be firing. Stretch: Lengthen Spine. Hug the Baby. Lunge/Lat Pulls – Step 1: Front Leg takes the majority of the weight, keeping knee in line with ankle, Glutes firing. 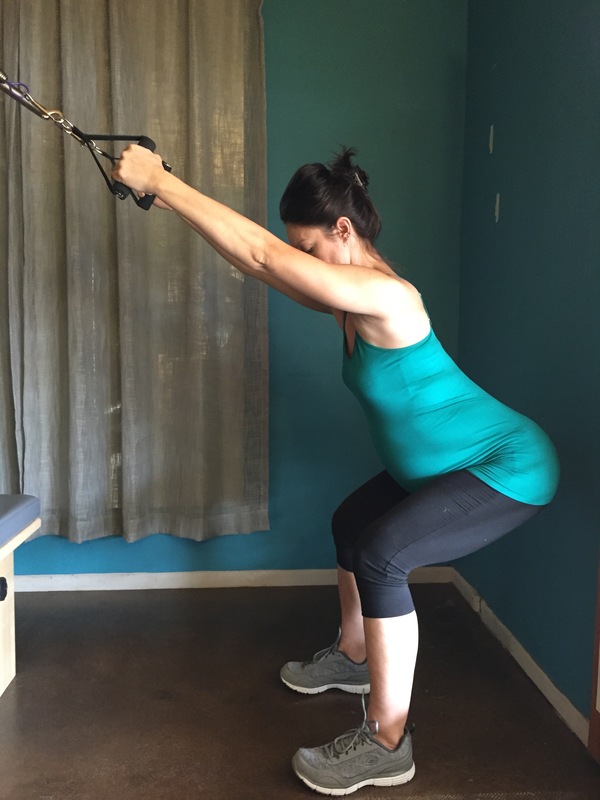 These types of exercises will give mom-to-be a sense of confidence in herself and her surroundings, helping her to feel strong and secure, which may give the insecurities of weight gain a back seat in importance. Questions or Comments? Please fill out the form below! 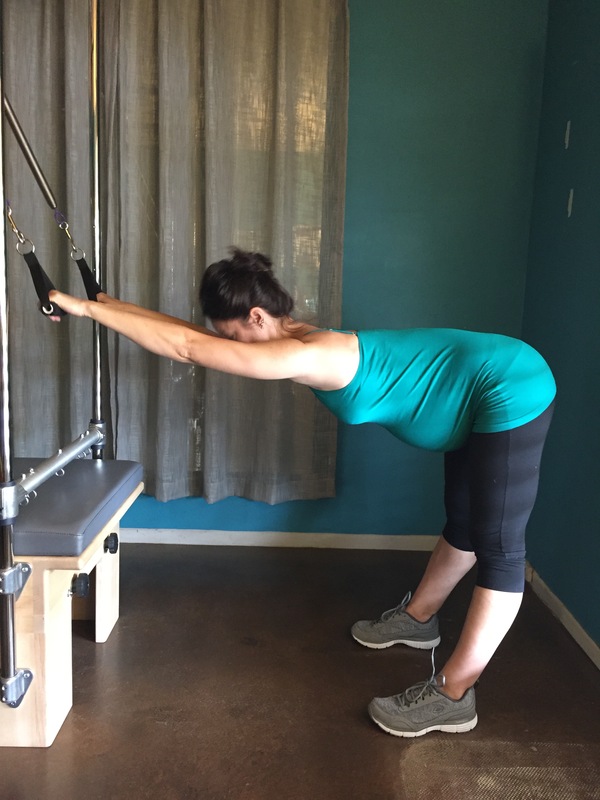 Thank You for investing your time to learn about pregnancy Pilates! PREPARING FOR A GENTLE BIRTH: THE PELVIS IN PREGNANCY by Blandine Calais-Germain and Nuria Vives Pares. Rochester, Vermont. Healing Arts Press, 2009.